PROVINCE ANTWERP FIRST DIGITAL AMATEUR RADIO VOICE REPEATERS. 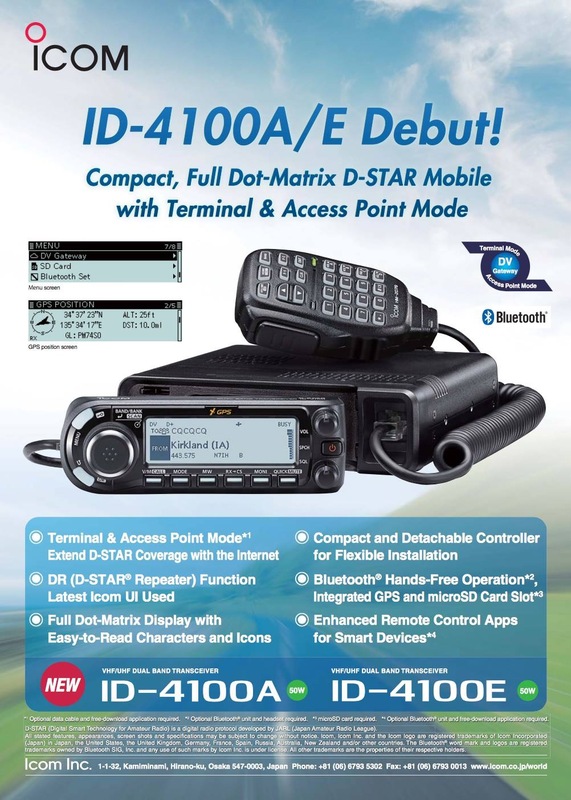 February 17,2017 : Icom launch today the news of a new D-Star / FM mobile transceiver ID-4100A/E. 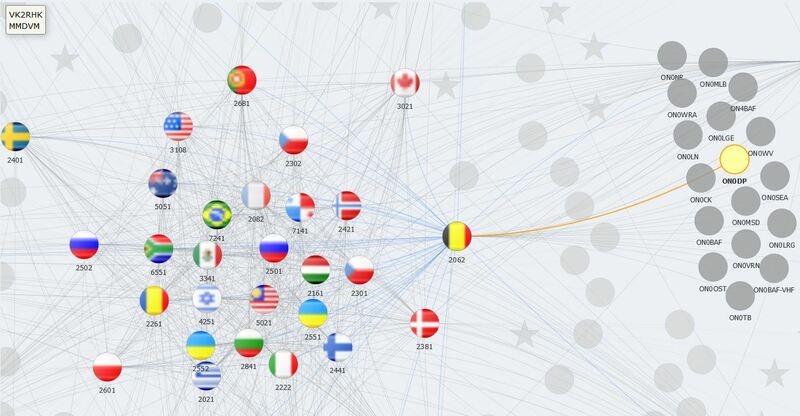 Jul 07, 2016 : The international Brandmeister network growing daily. May 30, 2016 : Digital Voice frequency Ham Radio 2016 Friedrichshafen. May 24, 2016 : Today we renew our computer system. This stronger and faster system give more speed and stability to all our repeater systems. May 21,2016 : A couple of new devices are showing during the Ham Radio show in Dayton USA. The DV4home and DV4mobile are two devices which can operate with D-Star, C4FM and DMR. April 02,2016 : After a long time of waiting for software changes the C4FM repeater is finally in full digital mode and connected to Wires-X. Today we change also the Comet CP95 antenna by a new one. July 01,2015 : After several weeks of test the ON0DP VHF System Fusion repeater runs now on the new official frequency of 145.787.5 MHz. The interference between the repeaters PI3UTR and ON0DP on 145.575 MHz are now ended. Thanks to the repeater team PI3UTR and PI2NOS for the technical support and PI3VLI for the frequency change. 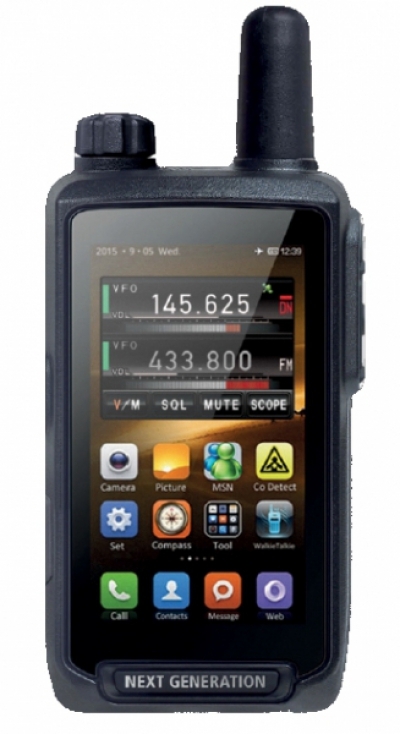 June 20,2015 : Pre-Friedrichshafen DV4mini news (D-STAR & DMR HotSpot): Advance Notice NEW! Production has started, price and lead time will be announced after HAM RADIO fair. NEW! 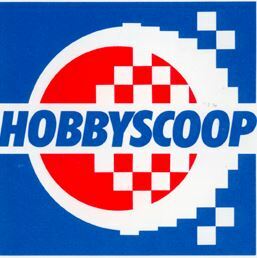 One of the first (or even the first?) D-Star and DMR Hotspots worldwide! Reservations: If you want to be part of the first production run you can reserve a DV4mini (not binding). Just send us a note using the contact form of the shop. We will then reserve the quantity and you will be notified at your email address as soon as an official order can be made. DV4mini is a tiny but powerful USB stick that can change any PC into a HOTSPOT for the modes D-Star and DMR (C4FM Fusion is being prepared). It contains a powerful 32-bit micro controller as well as a complete 70cm transceiver and modulator/demodulator for GMSK and 4FSK (including raised cosine) as well as a USB interface. It does not require its own power supply as it is powered through the USB interface. Thanks to a power saving voltage transformer even older USB interfaces will suffice. It will be shipped with a comprehensive but simple to use software package which allows for the linking with DCS reflectors for both D-Star and DMR reflectors. For Digital Voice enthusiasts: your handheld radio is no longer gathering dust. This hotspot brings the D-Star or DMR reflector directly into your shack. For DV Power Users: It is possible to plug several of these sticks into a PC, thus allowing simultaneous operation with several reflectors (even D-Star and DMR mixed). Well if you so desire you can fully use all your USB sockets with DV4minis and create a DV Center that way. For home brewers: the DV4mini runs well on single board computers e.g. Raspberry, BananaPi, Odroid etc.The minimum requirement is a Dual-Core. Such a hotspot would only need a few Watts and be useable in continuous service. For developers: The interface between the PC and the DV4mini is disclosed. With the DV4mini one can transmit and receive digital data in the 70cm band, without regard to the mode, as long as the mode is coded for GMSK or 4FSK. That means one cannot only transfer digital voice but also data. Your phantasy is the limit. For vacationers: due to the tiny size it can be brought with you on your vacation and thus create a hotspot in your hotel. Technical specs: Transmitter: Output Power: approx. 10mW Modulation types: GMSK, 4FSK Operating modes: D-Star, DMR, (C4FM Fusion in process) Harmonics: better then -60dB Receiver: Sensitivity: -120dBm Modulation types: GMSK, 4FSK Operating modes: D-Star, DMR, (C4FM Fusion in process) Digital specs: Data rates: 9600 or 4800 Baud, depending on the operating mode Bit rate HF: 4800 bit/s or 4800 dibits/s TCXO: long term stability: better than 2.5 ppm TCXO: short term stability: better than 1 ppm Interfaces: USB plug type A to connect direct, no cable needed Power supplied via USB Antenna SMA-socket, 50 Ohm (you will need an external antenna which is available in the shop) Software: DV4mini and dv4mini.exe: Software to create a D-Star and/or DMR Hotspot. Input options for the call sign and the DMR ID number and functions to link to reflectors. Runs on Windows and Linux Driver: The driver for Windows is included, Linux does not require one. Developer Software: DV4mini Library (in C) licensed under GPL 3.0, open source, includes all functions required to run the DV4mini hardware allowing you to create your own projects. 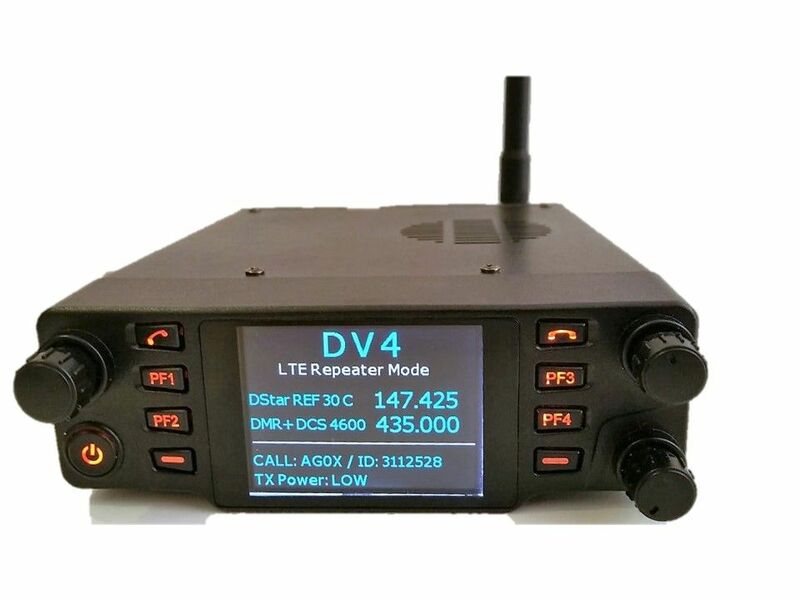 The DV4mini is a cooperation by: DG8FAC, DG1HT, DJ0ABR This Product was added to our catalogue on Thursday 18 June, 2015. http://www.helitron.de/shop/product_info.php?products_id=81 Advance NoticeNEW! Production has started, price and lead time will be announced afterHAM RADIO fair. NEW!One of the first (or even the first?) D-Star and DMR Hotspots worldwide! Reservations: If you want to be part of the first production run you can reserve a DV4mini (not binding). Just send us a note using the contact form of the shop. We will then reserve the quantity and you will be notified at your email address as soon as an official order can be made.DV4mini is a tiny but powerful USB stick that can change any PC into a HOTSPOT for the modes D-Star and DMR (C4FM Fusion is being prepared). It contains a powerful 32-bit micro controller as well as a complete 70cm transceiver and modulator/demodulator for GMSK and 4FSK (including raised cosine) as well as a USB interface. It does not require its own power supply as it is powered through the USB interface. Thanks to a power saving voltage transformer even older USB interfaces will suffice. It will be shipped with a comprehensive but simple to use software package which allows for the linking with DCS reflectors for both D-Star and DMR reflectors.For Digital Voice enthusiasts: your handheld radio is no longer gathering dust. This hotspot brings the D-Star or DMR reflector directly into your shack.For DV Power Users: It is possible to plug several of these sticks into a PC, thus allowing simultaneous operation with several reflectors (even D-Star and DMR mixed). Well if you so desire you can fully use all your USB sockets with DV4minis and create a DV Center that way.For home brewers: the DV4mini runs well on single board computers e.g. Raspberry, BananaPi, Odroid etc. The minimum requirement is a Dual-Core. Such a hotspot would only need a few Watts and be useable in continuous service.For developers: The interface between the PC and the DV4mini is disclosed. With the DV4mini one can transmit and receive digital data in the 70cm band, without regard to the mode, as long as the mode is coded for GMSK or 4FSK. 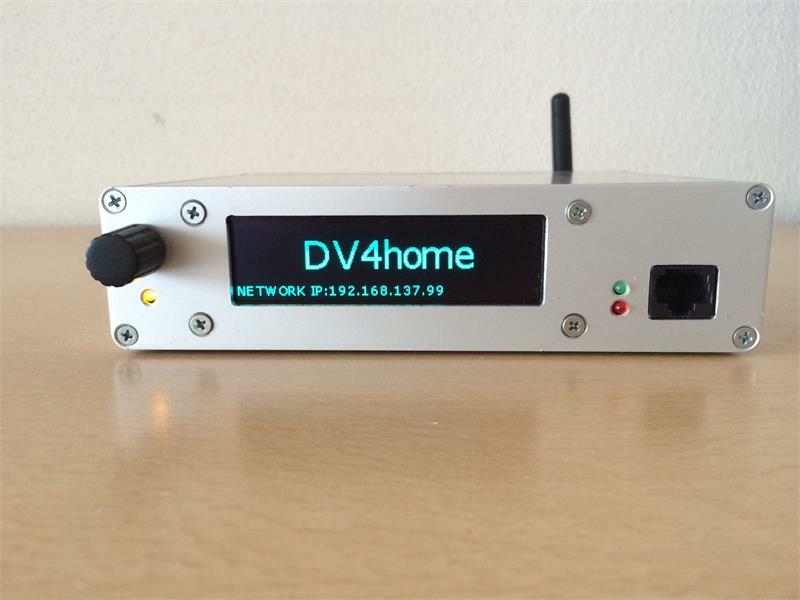 DV4mini and dv4mini.exe: Software to create a D-Star and/or DMR Hotspot. Input options for the call sign and the DMR ID number and functions to link to reflectors. DG8FAC, DG1HT, DJ0ABRThis Product was added to our catalogue on Thursday 18 June, 2015. 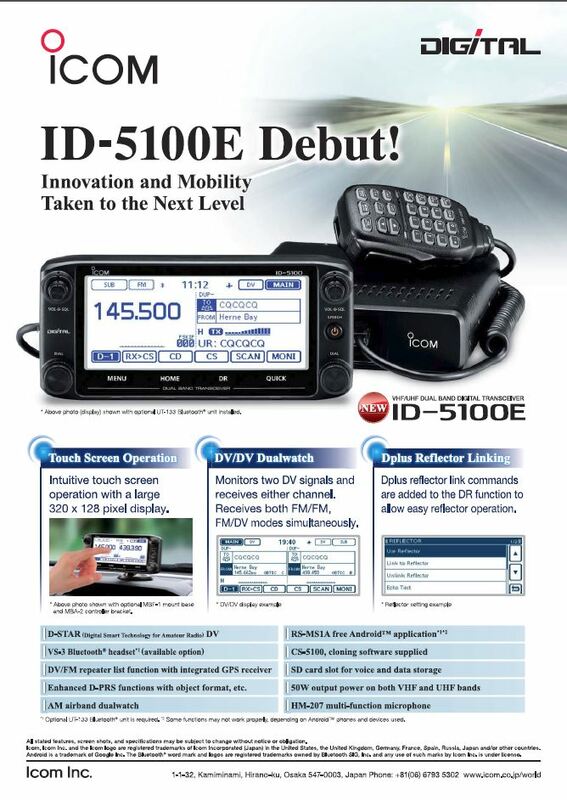 May 14 , 2015 : Yaesu announce a new Digital/Analog mobile Rig, FTM-100DE C4FM/FM 144/430MHz 50W DUAL BAND TRANSCEIVER. The FTM-100DE incorporates a wide range of System Fusion and analogue features with the Single Feature Design equipped with a Dot-Matrix Display. The newly designed display of the FTM-100DE is a very compact, vibrant and highly visible White-LED backlit display (16040 Full Dot-Matrix) and includes a bright multi-coloured Mode/Status Indicator on its faceplate. This Indicator is a very useful feature that visibly and clearly informs the operator of the state of the transceiver. For instance, it indicates what mode the radio is in by changing from Green (Analogue) to Blue (Digital) when receiving a signal, and the operator can easily recognize what signal is being received at a glance! The FTM-100DE utilizes Automatic Mode Select (AMS), which is one of the most distinguishing features of System Fusion that instantly recognizes whether a transmission is analogue or digital and appropriately switches the operating modes to allow flawless co-existence of both analogue and digital communication. In addition to AMS, the following attractive features are available with the FTM-100DE which should satisfy and fit most amateur radio operators needs, such as Smart Navigation, Digital Group Monitor (GM) featuring telemetry data and ID transmission, WIRES-X, a full featured 1200/9600bps APRS system, a built-in high sensitivity 66 channel GPS Antenna, GPS logging capability, voice guide and recording function, micro SD card slot (for both programming and data storage), and Bluetooth hands-free operation. Thanks to all the above carefully selected feature configurations, the FTM-100DE is at a very attractive price point and will be widely spread as an ideal communication product among both entry level and advanced ham radio enthusiasts. NB: Firmware upgrades, modifications and additions to the software are inevitable for all the digital radio operators to continue to enjoy the up-to-date and enhanced features of this digital radio. The FTM 100DE has a small, easy-open cap on the top, allowing quick and easy firmware updates by operators; no need to un-screw the case! Specifications FTM-100DE : AMS (Automatic Mode Select) function automatically recognizes the signal as C4FM digital or conventional FM,Smart Navigation*1,Digital Group Monitor,Supports advanced VoIP amateur radio WIRES-X,Easily establish a WIRES-X node station (Optional HRI-200 is required. ),High RF Output Power 50 W/ 20 W/ 5 W on the 144/430 MHz bands,160 x 40 dots Full Dot Matrix Display with White LED Back Light,Built-in 66 channel GPS Antenna (Front Panel),Receiving and Forwarding Image Data*2,DSQ (Digital Squelch Code) Signaling Feature,1200 bps / 9600 bps APRS Function,Wideband Receive for 108 MHz -999.99 MHz (cellular frequencies blocked)*3,Bright multi-colored Mode/Status Indicator vibrantly displays the transceivers status,microSD Card Slot,High Stability 2.5 ppm TCXO Included,Bluetooth Hands-free operation (Optional BU-2 and BH-2A are required. ),Voice Guide and Recording Function (Optional FVS-2 is equired. December 15,2014 : Today the UHF D-Star repeater is back on the air ! New Frequency : 438.462.5 MHz check it out. 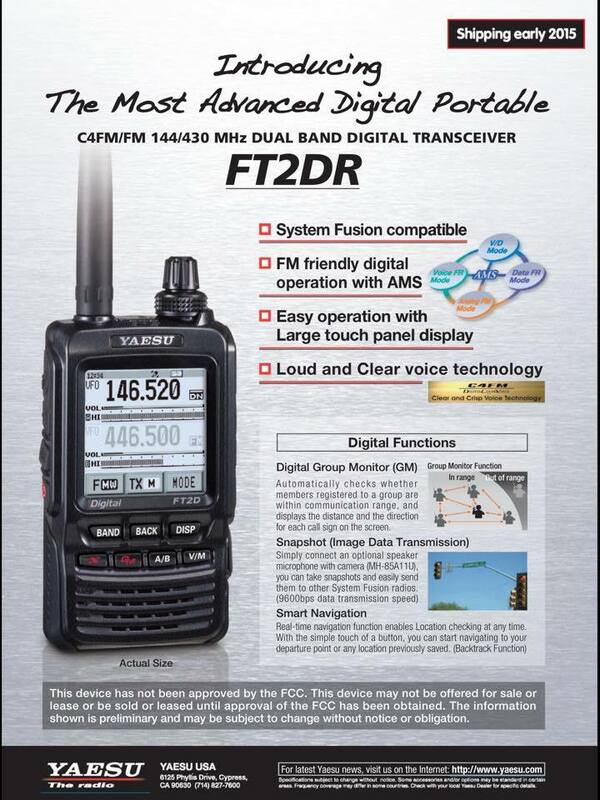 December 10,2014 : FT2DR brand new C4FM Hand held from Yaesu today announced for 2015. October 4, 2014 : C4FM (System Fusion) is on test via ON0DP 145.575 MHz. Select CTCSS tone 131.8 on TX and RX. For more information about C4FM look by C4FM on our website. July 2014 : Distribution and sale of Yaesus digital System Fusion has started. 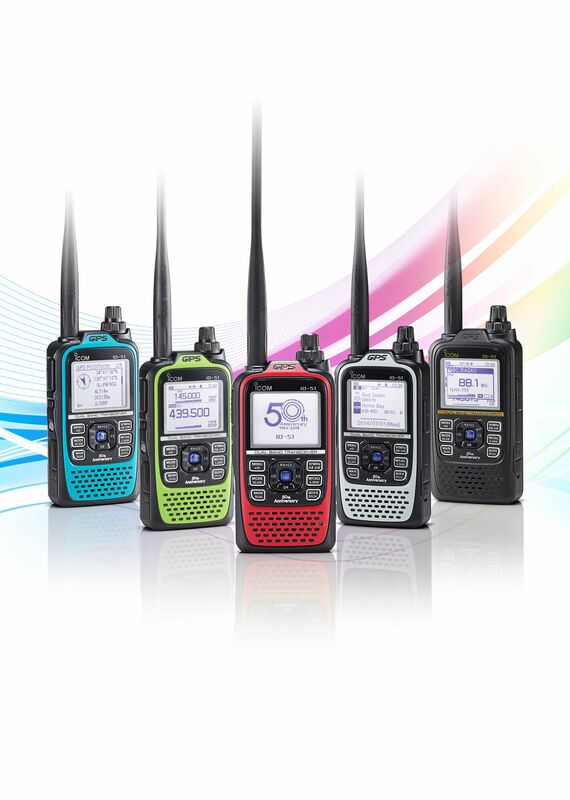 June 2014 : Special Editions of the ID-51E to Mark Icom’s 50th Anniversary. 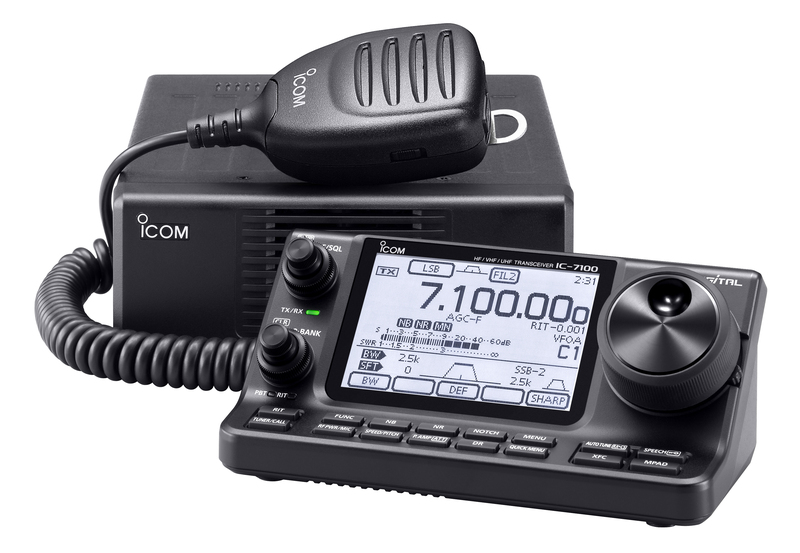 To commemorate Icom’s 50th Anniversary, Icom Inc is releasing five special editions of its popular ID-51E dualband D-STAR handportable. Not only will these models be available in red, blue, lime, white and black, but they will include the following special features. March 8,2014 : mounted a Comet GP-95 ,3 band antenna today for ON0DP repeaters. Icom Inc. have shown a new sample of a revolutionary VHF/UHF Amateur Radio Mobile Transceiver with touch screen control called the ID-5100(D). 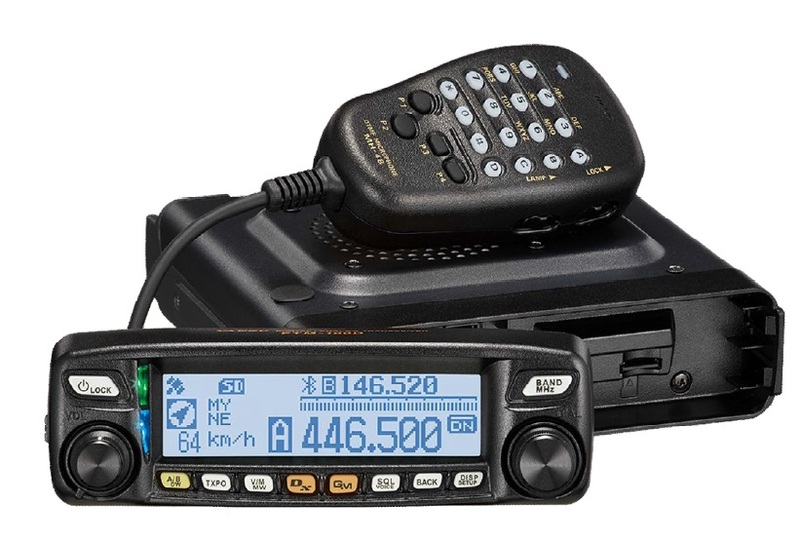 The ID-5100(D) is a VHF+UHF D-Star and FM compact radio with an innovative slanted touch-screen LCD controller. Optional UT-133 Bluetooth unit enables audio accessory connection and Android terminal connection (CI-V via Bluetooth SPP profile). Optional VS-3 Bluetooth pendant earpiece microphone has volume adjust buttons, PTT and three programmable buttons. Third party Bluetooth audio accessories may also be compatible (not guaranteed). RS-MS1A Android application will be a free to use download. It controls the radio for DR mode operation, exchanging text messages/pictures and showing GPS location over Google Maps. ESN (Electronic Serial Number) / SD Card slot (in the black box main unit). New HM-207 control microphone is supplied as standard. Android application demonstration in Japanese. January 2014 : Temporary using 3 band spare antenna for the 3 repeaters. Sensitivity VHF not yet optimal. January 1, 2014 : ON0DP VHF 145,575MHz from now on the air. After general discussion it was decided (temporarily) to move from the global DMR network. In this way we want to make the network more stable than the last few weeks with some updates that ensured regular outages. We continue to look how the global network grows and then we can join it again. To be fully compatible with other networks worldwide, we need to adjust some settings: Slot 2 used multisite –> From now SLOT 1 = Multisite! Slot 1 used locally –> From now SLOT 2 = LOCAL! 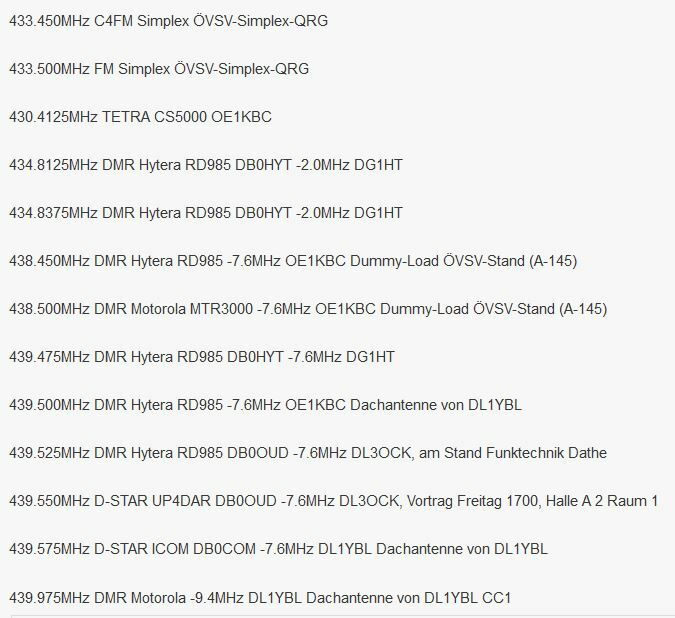 September 2013 : ON0DP 70cm DMR repeater is on the air and connected to the world wide HAM DMR network ! The 70cm D-Star repeater moves on a later date to the new frequency 438.9875 Mhz. 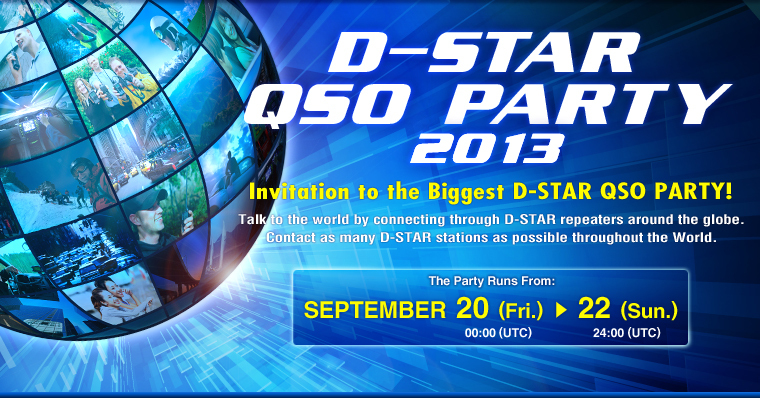 August 2013 : ON0DP 70cm D-Star repeater will be in a very short time replaced by a 70cm DMR repeater. However, DMR is not compatible with D-Star ! 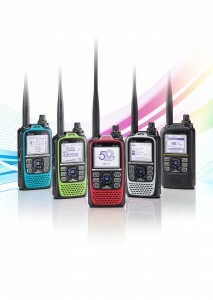 DMR is another certified standard for private digital radio, so called “Digital Mobile Radio”. Beyond many DMR radio networks in the world a DMR based ham radio network was established. Which currently consists more than 100 repeaters all over the world. 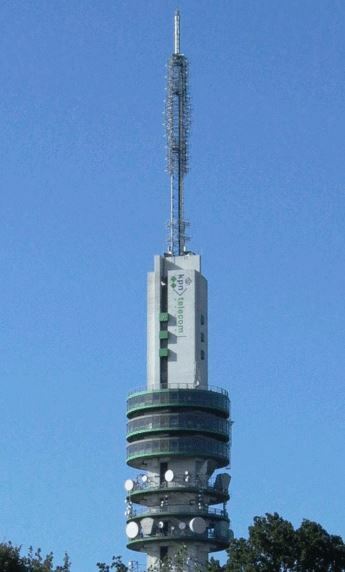 The repeaters are linked via the internet and offer worldwide communication. By selecting the right talkgroups enables you to communicate on local repeater, nation wide or worldwide. June 2013 : ON0DP home reflector is REF028A for 70cm and DCS011A for the 23cm repeater. However, all D-Plus and DCS reflectors can be connected. April 2013 : ON0DP home reflector is now DCS 011. March 2013 : ON0DP will change to DCS and CCS in the next few weeks. You will find more information about DSC/CCS on our D-Plus vs. X-Reflector tab. August 25 2012 : This weekend (August 25) , two new D-Star tranceivers presented at the Tokyo Ham Fair 2012. ID-51 : D-Star Dualband handheld tranceiver. Icom Inc. have shown a prototype of a new dual band D-STAR handheld radio at the Tokyo Ham Fair 2012 which is being held between August 25th and 26th 2012 in Tokyo.The ID-51A/E series D-STAR handheld radio is an evolution of Icom’s ID-31A/E UHF D-STAR Handheld and will be capable of both VHF / UHF 144MHz + 430MHz dual band operation. The ID-51A/E will also include the much praised menu-driven user interface of the ID-31A/E series with a much bigger LCD screen. The ID-51A/E will also feature integrated GPS & D-STAR as well as IPx7 waterproofing, SD-Card slot and slim body found on the ID-31A/E. .VHF/ UHF capable 144MHz and 430MHz dual band (Only one DV signal can be received, similar to the manner as the IC-2820H/E2820 series). .Enhanced logging function. The ID-51A/E records frequencies, time, position and other operation related information on the SD Card. .Voice recorder function (not the communication logging function but a simple digital voice recorder function which records your voice). .Frequency and mode of operation speech and specific frequency beep function helps blind hams for easier operation. .Enhanced RX call sign memory records up to 50 past received call signs, which can be exported to micro SD card. .Increased memory channel for repeater list (750)/ GPS memory (200). IC-7100 : Multiband mobile D-Star Tranceiver. Icom Inc. have shown a new sample of a revolutionary HF/VHF/UHF Amateur Radio Mobile Transceiver with touch screen control called the IC-7100 at the Tokyo Ham Fair 2012.The IC-7100 is a HF+6m+VHF+UHF all mode compact radio with an innovative slanted touch-screen LCD controller. A first for an Icom transceiver, the IC-7100 is designed to the 70MHz band in European versions where 70MHz is open to Amateur radio enthusiasts. To maintain its commitment to D-STAR, all versions of the IC-7100 will come with standard D-STAR DV mode.Since the launch of the original IC-706 in 1995, Icom has been leading the market of HF/VHF/UHF multi-band mobile radios. 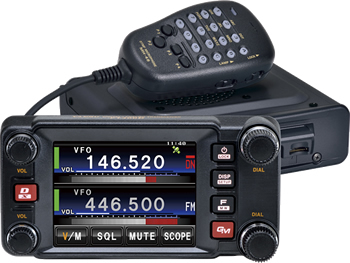 The popularity of vehicular mounted amateur radios may not be as high as the times of the IC-706 series, but the IC-7100 has been carefully designed to reignite Amateur’s interest in mobile communications and brings digital communication opportunity to a wider range of radio Amateurs.